First 25 Sonoma State University students with valid ID get in Free! To get your free ticket, you must come to the ticket table at the concert and present your current Sonoma State University student ID. These tickets are available only between 7pm and 7:30pm and are distributed on a first-come, first-served basis. 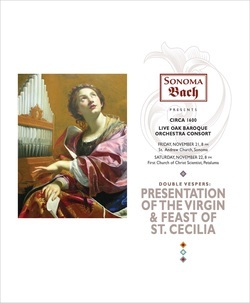 Featuring the music of Monteverdi, our chamber choir Circa 1600 and the continuo section of our period-instrument ensemble Live Oak Baroque Orchestra Consort, directed by Robert Worth, present two concerts of music for Second Vespers on successive evenings: The Feast of the Presentation of the Virgin in the Temple on November 21 and the Feast of St. Cecilia on November 22.